(1) Route confirmation required. Passengers used shuttle services to get to/from Rainhill. 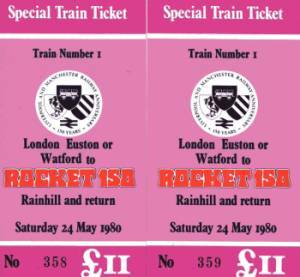 The ticket letter and ticket classed this as "train 1" and Alan Osborn confirms he was aware of no less than eight departures from Euston that morning (5 for BR, one of which terminated at Allerton and 3 for private operators, two of which terminated at Runcorn) and he personally travelled on "train 4". Two of Robert Frise's tickets for this train.